Organic chocolate is made using all or part organic ingredients. Organic ingredients are free from artificial chemicals such as pesticides and fertilisers and have been grown or produced in a way that is sympathetic to the local community and wildlife. A bar of organic chocolate will typically be made with organic cocoa beans and organic sugar. If the chocolate is being made into milk chocolate then organic milk solids will be added (derived from cows who were fed organic food and not injected with any drugs or antibiotics). Other flavourings, such as vanilla, orange and mint will also have been grown and produced organically. Similarly, a box of organic truffles or liqueurs will contain chocolates with organic fillings. Organic cocoa beans are grown using sustainable and biodiverse farming methods, which support a balanced and natural ecosystem. Their organic production relies on the natural ecosystem to ensure the crop grows successfully. The land in which the cocoa beans are grown is treated in a sustainable manner so that it can continue to provide food without becoming exhausted of nutrients. In the UK, organic products are normally certified by the Soil Association. The Soil Association is the leading organic certifier in the UK, and gives consumers of organic products a guarantee that the product is from a trusted source and matches the high standards of production. Organic ingredients can often have a more superior, intense flavour than non-organic chocolate. 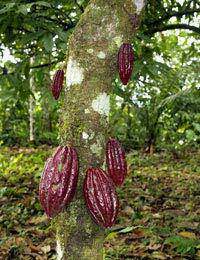 This is because the cocoa trees are put under less pressure when they are growing so they produce cocoa beans with a better flavour. It is also thought that farmers who grow their crops organically are often more interested in their crop and therefore concentrate more on the taste than the larger conventional food growers. They are therefore more likely to choose tastier varieties of cocoa tree and opt for growing methods that ensure that they can successfully grow their crops without the use of chemicals. This can often result in the reintroduction of obscure varieties that may have a better natural flavour. A lot of organic chocolate is also considered Fair Trade. This means that not only do farmers get help to produce their cocoa in a natural way, but they get a fair price for it too. Fair Trade farmers are often given long-term contracts, which guarantee them a steady income for several years. This gives farmers security, helping them to improve their quality of life, provide a better education for their families and offer stability to the local community. Eating organic chocolate is better for you, the farmers who grow the cocoa beans and the local environment in which they are grown. Without the inclusion of artificial chemicals, such as fertilisers and pesticides, you will absorb fewer chemicals (non-organic food can contain chemical residues which are absorbed into the body when eaten). The local wildlife will also benefit from a reduction in chemical sprays, as will the soil, farmers and their families. What’s more, organic chocolate can taste nicer than non-organic chocolate.